The Gospel of Luke's account of Jesus forgiving the sinful woman shows how his actions went against the general mentality of his time, a way of thinking that saw a "clear separation" between the pure and impure, the pope said Aug. 9 during his weekly general audience. "There were some scribes, those who believed they were perfect," the pope said. "And I think about so many Catholics who think they are perfect and scorn others. This is sad." Continuing his series of audience talks about Christian hope, the pope reflected on Jesus' "scandalous gesture" of forgiving the sinful woman. Although Jesus' love toward the sick and the marginalized "baffles his contemporaries," it reveals God's heart as the place where suffering men and women can find love, compassion and healing, Pope Francis said. "How many people continue today in a wayward life because they find no one willing to look at them in a different way, with the eyes—or better yet—with the heart of God, meaning with hope," he said. But "Jesus sees the possibility of a resurrection even in those who have made so many wrong choices." Oftentimes, the pope continued, Christians become accustomed to having their sins forgiven and receiving God's unconditional love while forgetting the heavy price Jesus paid by dying on the cross. 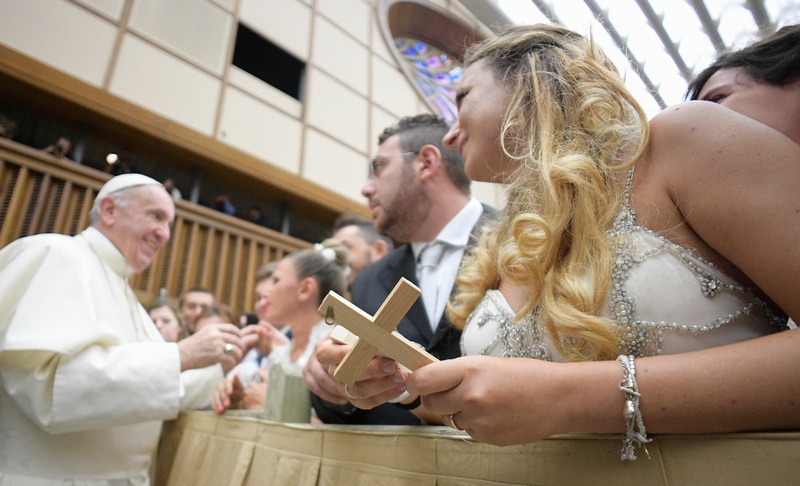 By forgiving sinners, Jesus doesn't seek to free them from a guilty conscience, but rather offers "people who have made mistakes the hope of a new life, a life marked by love," the pope said. The church is a people formed "of sinners who have experienced the mercy and forgiveness of God," Pope Francis said. Christians are "all poor sinners" who need God's mercy, "which strengthens us and gives us hope." Pope Francis is describing the traditional Church I grew up in as the desired Church. I never saw anyone espouse what he says the "perfect" Catholic espouses. But I do meet them here on America, people whose attitudes are so far from those who were taught by the Jesuits years ago. Like the 2 comments immediately below this one? This verbal technique of his cannot be imagined in the previous Popes...and none of them were virtual trads (witness the last two on the death penalty). It does seem like deflection whereby he never has to answer to real doctrinal problems by this method of morally misrepresenting those questioning him on aspects of AL as it regards firm purpose of amendment prior to Communion. Since he never mentions them by name, he artfully knows his sector of friends will fill in the names. Some kind of rash suspicion sin is in all this and that's why his predecessors didn't descend to this level of interpersonal jousting. Endless strawman hysteria and contempt from this pope. Never a single example even in the form of an abstract proposition of what those he loves to hate have allegedly said. It's funny that he would say this of people who are more likely to go to confession than those who scorn the practice. In fact, the fact that confession lines have shrunken to almost non-existence in half a century would tend to suggest to a thoughtful, sad, or holy person that the problem in the Church is not too much reflection on sin, but too little. Do those that do not repent experience the mercy of God? Hi Steve, I think "Yes," God forgives even the unrepentant, because God doesn't wait for the right moment to forgive, his attitude always one of forgiveness, as God doesn't change his mind, one day this, the next day something other. As Scripture says, "God's mercy is above all his works" allowing the unrepentant any number of chances to turn from sin. It's all up to us to make that move, even a little change which admits "Maybe I was wrong" will do it as conversion gains a foothold, vivifying God's spoken word that, "God gives his Grace to the humble." God is mercy personified, for him not a "sometimes thing." As Jesus once said, "God knows what is in man," and reaches out ever ready to "high five" the sinner, the gentle Jesus with that friendly wink doing what only God can do, looking beyond the oozing stench of sin, to see the beautiful garden of Grace in full bloom just a few steps away! That's what I believe. May we put Christ back in Christian. As well accept that as Catholics. We should be Christians in the example of Christ. And Christ told the Samaritan woman at the well that the man she was with now was not her real husband....and Christ just met her there. He didn't accompany her for more than five minutes and in those five minutes, He told her she was with the wrong male. How does Pope Francis remotely resemble that Christ in that incident? There is such a thing as sincere erroneous conscience but Christ didn't join Himself to the sincere erroneous conscience of the people He spoke to. My diocese is joining the possibly sincere erroneous conscience of active gays and giving them Communion. Show us Christ doing such....example...chapter and verse....not sweet generalities. Who brings people to Jesus by casting them out? Want chapter and verse? Luke 6:37. Are you judging only sins between the navel and knees, or are we denying communion to liars, thieves, those who don't share with the poor, etc? Our Christ of mercy did say sin no more. As well he gave us the sacrament of penance so we would know forgiveness. Communion should be denied to any public, continuously unrepentant sinner. I think Pope Francis would actually refuse to give Communion to mafia people. Liars and those who don't share with the poor are not public sins ie you might be wrong about that judgement. Judging is what WE are not to do. What if someone who legalistically shouldn't does receive communion. Who are we to judge? We are not to judge. That is not what we are called by Jesus to do. "Judge not" is stated loud and clear several times in the gospels and epistles. Correct Jim...but neither is the priest supposed to help such people receive unworthily. Silence and active helping are a world apart. Incorrect. We are to judge things justly and scripture is replete with that teaching and examples. (I can provide them if you so desire.) When we are aware of injustices we are obligated to judge them and act in a way that will make it right, even, in some cases, if correcting the injustice does harm to those committing them. To put this in a better perspective, if people are gravely sinning they are putting themselves at risk of spending eternity in hell. Further, if their sin is public then they are causing public scandal and could be leading others into grave danger as well. In such cases, we are *obligated* to judge and take the proper steps to, a. help the persons to come to repentance so that they can be saved, and, b. Help the persons avoid and/or repair the public scandal so that others are not deceived. In cases such as these, the question "Who am I to judge" has alot in common with "Am I my brother's keeper?" there is a well-founded expectation that the admonition will be heeded; ( STEVE...BURN THAT IN YOUR MEMORY ). William, I am not missing anything. We are talking about judging, and even the Catholic encyclopedia entry makes it clear that we are to judge. For example, "That there is, upon occasion and with due regard to circumstances, an obligation to administer fraternal correction there can be no doubt. This is a conclusion not only deducible from the natural law binding us to love and to assist one another, but also explicitly contained in positive precept such as the inculcation of Christ: "If thy brother shall offend against thee, go, and rebuke him between thee and him alone. If he shall hear thee, thou shalt gain thy brother" (Matthew 18:15). Given a sufficiently grave condition of spiritual distress calling for succour in this way, this commandment may exact fulfilment under pain of mortal sin." Of course prudence is necessary, but even the encyclopedia lists reasons for violating the list of requirements that you mentioned. We are to correct. Prudently and charitably, yes, but correction is an act of charity and can even be an obligation. There is nothing compassionate or charitable about doing nothing under the banner of "do not judge" when our brothers are skirting the edge of the precipice. Actually you're determined to fraternally correct regardless of whether it is likely to succeed. Prophets, religious leaders do that in a general way as when Christ harangued the pharisees. Private people do not do so on a particular level because it means you're willing to augment their condemnation. Private fraternal correction with little likelihood of success is a sin not an achievement. And it could be a form of hate or revenge. Actually, if it weren't an obligation I would rather not correct. In fact, I will likely be judged for my lack of correction. On the other hand, many are determined not to correct even in the most obvious cases where correction is just and absolutely needed. As a result many will likely not repent and ever experience God's mercy and forgiveness. We should hope and pray that we never stoop to that lowest level of complacent cruelty towards our brothers, but sadly many are already there. There is nothing more abusive to Scripture than a refusal to understand that do not judge refers to souls, not to behavior or principles of right and wrong. "Truly, I say to you, whatever you bind on earth shall be bound in heaven, and whatever you loose on earth shall be loosed in heaven" (Matt. 18:18). The Apostles and those who came after were instructed to make a judgement on one's sincerity when asking for forgiveness. As Pope Francis says, it is sad. Setting and enforcing high standards is no substitute for love. Inevitably, the standards are human and devolve into the kind of line drawing that Jesus railed against in Matthew 5. Trying to overcome low standards by setting high standards misses the point. Take reality as it is, not as humans idealize it to be. Jesus calls us to work with a messy reality, as in a field hospital, investing that messiness with love. You mean like when Christ said, " Be perfect as your heavenly Father is perfect". You have a valid point but you're destroying it by absolutizing it. Christ was very demanding of some people and less so of some. You're absolutizing the latter and ignoring the former. Praying for the conversion of perfect Catholics is indeed a charitable act. Indeed. Seems proper, it seems to me, too, to also pray for those who, like the elder son, serve their father faithfully but could not be like their father in his compassion and welcome for his "prodigal son". And that son was not even coming back home because he was repentant but because he was hungry. And yet his father received him and restored him to his household. May the "elder sons" hear the father say, "your brother..."
The more Pope Francis speaks "on or off the cuff" often before crowds or especiallyreporters, the more he reminds me of Peter Sellers's Chance the gardener, better known as Chauncey Gardiner, from the movie 'Being There' who spoke simple words, spoken often due to confusion or to a stating of the obvious,which are repeatedly misunderstood as profound and often, in the Pope's case when he speaks or writes on economic systems, capitalism, climate change, immigration and other worldly matters, several factually in error, or even matters of a possible/potential change in long held Catholic doctrine which are walked back or explained later by a Vatican spokesperson. Is it any wonder that different people hear different signals when the Pope writes or speaks? Pope Francis chose his name very carefully. St. Francis was accused of many of the same things. Pope Francis is close to God, and the Holy Spirit speaks through him. The Holy Spirit spoke through Christ as Christ affirmed the old covenant death penalty for cursing one's parents in Mark 7:10. Pope Francis said last June that the fifth commandment condemns the death penalty yet the same God gave the Jews multiple death penalties as in the case of the one Christ affirmed in Mark 7:10. I know of no other papal statement in history that is as erroneous as any of Pope Francis' comments on the death penalty which the Holy Spirit affirms in Romans 13:4 also....after affirming it in Gen.9:5-6 and over thirty other places in scripture. Pope Francis is infallible only when he speaks 'ex cathedra' on matters of faith and morals guided by the Holy Spirit, climate change and other non-religious matters are above his pay grade. It is only his opinion and those of his liberal activist advisers. Catholics are not obligated to follow the Pope's opinions on politics,science,economics or other worldly matters. The Holy Spirit is not recklessly sanctimonious and hatefully and dishonestly vague in accusations. In recounting Christ's forgiveness of the sinful woman, Pope Francis omits His last line, ".... Go, and sin no more." And I have to wonder why. He is surely able to see the one-sided message he delivers here. "Admonishing the sinner" is probably the least popular of all the Spiritual Works of Mercy--and therefore is probably the most necessary. As an example of a truth seldom told in the modern age: the Sixth Commandment is real; violate it at your soul's peril. Forgiveness of sins requires acknowledgment of them, repentance, and a firm purpose of amendment: "Go and sin no more." This is available to all who turn to God's Mercy. But God's Mercy also requires us to call the Church, and the world, to holiness. Telling this truth does not make us "perfect" or "scornful" Catholics. It makes us faithful sinners striving for holiness. When reading the lives of the Saints, one is struck by the closer they grew to God the more they realised what grievous sinners they were and thus the more appreciative they were of God's forgiveness. do their best to follow their own interpretation of Vatican II to a "T". Both seem to have an inclination of looking down on the other. to the Homeless, the Refugee, the Prisoner, the Poor more often.